Despite the paucity of ecological engineering optimization of phytoremediation applications to minimize costs and to achieve full sustainability, a number of ad hoc applications have been successful. These are summarized in Table 1. Wetlands prevent all discharge of explosives contaminated groundwater at the Iowa Army Ammunition Plant (Figure 3). Fertilized grass plantings and marshes of Spartina alterniflora and S. patens have cleaned up petroleum spills at a number of sites and are overdue for optimization and development of design guidance. Tree plantations have successfully stopped and mineralized groundwater plumes of chlorinated solvents and methyl tert butyl ether (MTBE). A number of treatability investigations using standard groundwater and vadose zone models establish that transpiration can be adequately forecast and can con trol plumes in difficult settings. Three year old trees have been planted in casings up to 15 m (50 feet) deep to reach contaminated aquifers underlying clean aquifers and soil. Highly toxic cyanide contaminated soils shown in Figure 4 are being cleaned up using a tree plantation in Holte, Denmark; this is so effective that the site is being used as a park during the process. Vegetation capping and control of landfill leachate has been successful at a number of sites across the US (see Figure 5) and is being applied in Australia and a number of other countries. The feasibility of metals' phytoaccumulation, the pro cess first called phytoremediation, has been investigated, but very few field scale tests have been attempted. Unfortunately, a few critical field tests have been unsuc cessful. Figure 6 describes some of the elements for which plant uptake or control is feasible. Pilot investigations by the US Bureau of Mines establish that some plants accumulate enough nickel to be cost effectively smelted or refined. Pilot field testing of cadmium and zinc hyperaccumulation has been successful at two sites. Unfortunately, six field scale pilots and rigorous demonstrations for lead accumulation have failed. The failure to optimize chelator applications to release lead and other tightly bound metals like chromium have resulted in only approximately 25% of the lead released from the soil being accumulated by plants. The remainder leaches into the groundwater or deep soils. 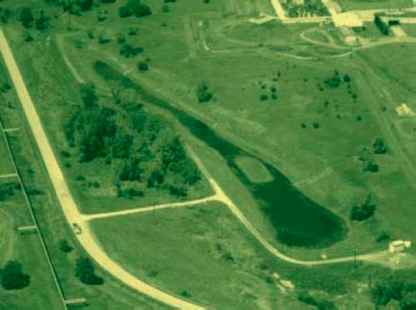 Figure 3 One of two constructed wetlands at the Iowa Army Ammunition Plant that has zero discharge of TNT and other explosives seeping out of the contaminated groundwater below the explosives manufacturing line shown in the upper right-hand corner. Explosives-contaminated soil was dug up along a stream channel leaving a pit that was then shaped to capture all contaminated groundwater and favor indigenous aquatic plants known to transform explosives. By not having to refill the pit with clean soil, approximately US$ 700000 was saved. Sediment from local wetlands was used to seed the constructed wetland and provide nutrients. The stream channel was moved to the left as shown to convey less-contaminated stream flow around the wetland. The initial 28 months of monitoring showed elevated explosives concentrations entering the wetland each spring, decreasing in peak concentration the second spring, and dropping to undetectable levels by fall due to plant and algae uptake and transformation. Thorough sampling and analysis established that explosives and the associated transformation products were undetectable and thus did not accumulate in the indigenous wetland plants and algae. The wetland control structure at the lower right of the photograph has never been opened, thus achieving a zero discharge. Evaporation prevents flow out of the wetlands. Slightly more was spent than the US$ 700 000 cost savings and this small difference was due to added monitoring costs of these pilot applications. Thus phytoremediation is not only less expensive, but reduced site restoration costs can also fully offset construction and monitoring costs. Photo courtesy of Kevin Howe, US Army Corps of Engineers, originally and used on the cover of Phytoremediation (2003) Wiley. harvest and disposal of plant materials. The rate of metal uptake per unit area, the target residual accumulation at harvest, the time available for cleanup on different parts of a contaminated site, and monitoring requirements are design variables selected to achieve economically and sustainably optimized solutions. The US state of the practice at this early stage requires metal laden plants be disposed in expensive hazardous waste landfills. Metal recycling to smelters, established as feasible for nickel, and composing or incineration to reduce the volume disposed in landfills do not seem to have been rigorously explored. For phytodegradation and accumulation of organic com pounds, food chain accumulation and exposure offsite is the primary concern. Extensive pathway analysis based on advanced chemical analysis and mass balances of radiola beled compounds; monitoring of accumulations in roots, stems, leaves, insects, and animals; and toxicity testing of plant residues establish that most phytoremediation appli cations do not cause exposures off site or during treatment. For polyaromatic hydrocarbons (PAHs), insects take up the contaminant and by products during phytore mediation but have some of the same enzymatic activity that completes transformation without further food chain exposure. Insects that take up explosives and by products depurate within hours of ending the exposure. However, not all potential exposures have been explored and thus each application requires monitoring of accumulations for 3-5 years depending on the contaminant and the setting involved. Because phytoremediation approaches have not been optimized and design guidance written, all almost all applications require pilot or treatability studies before full scale up is undertaken. In a number of cases, phyto remediation is inexpensive enough that pilot studies may be undertaken at full scale if adequate backup options of cleanup are provided. 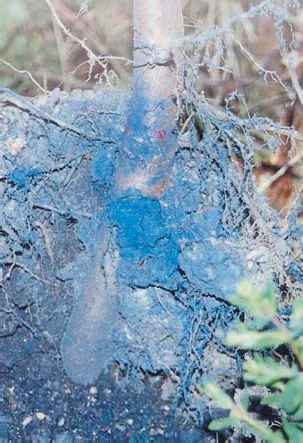 Figure 4 Black elder (Sambucus nigra) tree growing into soil contaminated with a prussian blue cyanide complex. Courtesy of Tim Mansfeldt, Front cover, UWSF-2umweltchem Oekotox, 12(3): 2000. Figure 5 Eastern Oregon landfill (foreground) leachate collection system (see storage pond on right) and hybrid Populus spp. plantation irrigated with leachate (upper left and center) and harvested for paper and pulp. Originally courtesy of Jim Jordahl, CH2M Hill Consulting Engineers and Scientists, Des Moines, Iowa. of grass and trees to hold soil and contaminants in place during assessment of risks and cleanup alternatives. Selection of the right plants and monitoring have led to temporary vegetation becoming a final remedy for cleanup and control of a site until complete removal occurs. In general, phytoremediation is a niche waste manage ment technique, normally applied to manage or clean up low levels of contaminants over large areas. Some cleanups may occur within months to a year or two, but typically 3-5 years are required and some difficult to manage sites may require decades to clean up. 'Phytostabilization', which does not seem to be sustainable, may be the only technically feasible option for large sites on which animal and human exposure can be controlled while innovative options are explored and developed. While most phytoremediation applications are limited to sites with chronic toxicity or conventional waste disposal of municipal sewage or sludge because of phyto toxicity, some innovations allow cleanup of acutely toxic wastes. For example, sterile, contaminated soils can be flooded and nonrooting wetland plants used to rapidly transform leaching TNT. Wetland cells can be designed with hardy pioneers, dead plant materials, and highly active sediments to buffer the highest incoming explosives concentrations. Because cyanide is a secondary metabolite, some trees grow into soils that are acutely toxic to mammals and break the waste down completely enough that tree plantations with appropriate ground cover can be converted early to parks and other less restrictive land uses (Figure 4). Burrowing animals must be excluded until the tree roots have sufficient time to explore all parts of the soil and break down the cyanide complexes. 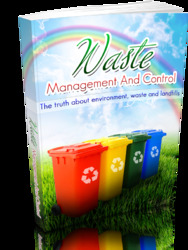 Some acutely toxic wastes can be treated in more expensive and energy intensive unit processes. Cofactors, amendments, and hazardous by products can be highly and reliably controlled. Ex situ treatments tradeoff cost savings achieved with in situ treatments for control of pH, temperature, and other factors. For example, a feasible unit process to remove phenols from liquid wastes uses horseradish peroxidases, but to date, this process does not seem to have been scaled up and applied to an actual waste stream. Treatment of liquid wastes contaminated with explosives have been proposed using slurries of plants high in nitroreductase activity and excavated soils con taminated with explosives could be buried with plant material high in nitroreductase activity. 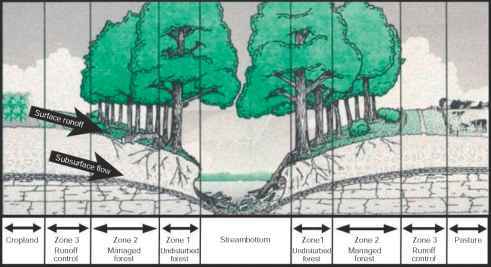 Most phytoremediation applications are limited to root zones and shallow waters, but occasionally exudates leach below root zones to generate reducing conditions and spur microbial dehalogenation 3-5 m (10-15 feet) deep. Transpiration can pull slow moving groundwater plumes into the root zone, into wetland soils, and into plants to completely clean up some sites. 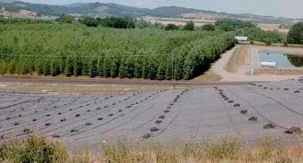 Feasibility stu dies indicate plumes may be controlled to depths up to 15 m (50 feet) by very large plantations depending on the hydraulic conductivity of the aquifer, the control of sur face runoff, and the rooting depth of the trees or grasses employed. Some solar pump and treat applications apply root training and management to optimize root contact with contaminated soil and water. Figure 6 Periodic table of elements for which phytoextraction, rhizofiltration, phytosorption, phytostabilization, and phytovolatilization are feasible. For many elements, cleanup has not been proven in concept or principle in laboratory, pilot, or field tests. Some elements have not been tested to determine if phytoremediation is a feasible management option. Selenium and arsenic are also subject to phytoextraction and hyperaccumulation by some plants. Tritium is phytovolatilized and hydrogen ions, of which pH is a measure, can be controlled with wetlands specifically designed to treat acid mine drainage. Some wetlands do not remove and accumulate all the metals listed under all conditions (e.g., lead and nickel). Even though very few phytoremediation applications have been optimized for sustainability, most applications are inexpensive and have many secondary benefits. Sunlight is the chief energy source in most applications. Ecological restoration begins during treatment, rather than after, com pared with many cleanups that rely on heavy equipment, incineration, and other intense treatments, harsh chemicals, and traffic of heavy vehicles into and out of the site. These intense cleanups may be necessary when longer periods of time and sufficient land areas are not available, or acute phyto and human toxicity cannot be managed in situ.